Sweet, crazy conversations full of half sentences, daydreams and misunderstandings are more thrilling than understanding could ever be. A sister can be seen as someone who is both ourselves and very much not ourselves, a special kind of double. I remember a very important lesson that my father gave me when I was twelve or thirteen. He said, You know, today I welded a perfect seam and I signed my name to it. And I said, But, Daddy, no ones going to see it! And he said, Yeah, but I know its there. So when I was working in kitchens, I did good work. New Updates! (4/25/2019) We've been working really hard on completing our membership system so you can submit quotes and keep track of them. Once this is complete in the coming weeks there will be a lot more quotes by Toni Morrison and other authors. We've also changed the sorting on the site so you now see the latest Toni Morrison quotes first. 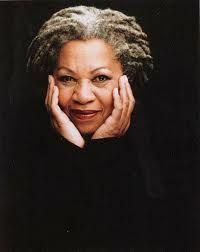 Our goal is to have the best Toni Morrison quotes on the web!